“Of all the forms of inequality, injustice in health care is the most shocking and inhuman,” Martin Luther King Jr. told the Medical Committee for Human Rights (MCHR) at its 1966 convention . Hundreds of doctors, nurses, and other health care workers had rallied behind the organisation and its predecessor, the MCCR, in the previous three years. Two hundred of them had joined the 1963 March on Washington, where members of the American Nurses Association and the National Medical Association rallied under the MCCR banner to hear Dr. King proclaim “I Have a Dream”. These physicians and nurses went on to provide care for civil rights activists during the 1964 Freedom Summer, and first aid to protesters who were injured by tear gas and beatings at the 1965 Selma to Montgomery March. They visited injured protesters in jails and hospitals, which in the South were often less than eager to care for civil rights workers, to ensure their treatment. In the meantime, their original cause endured: getting the American Medical Association (AMA) to stop tolerating segregation in all-white local chapters. It took until 1968 before the AMA gave in. Many of these health care professionals wanted to go beyond using their skills and stamina to support civil rights protesters on marches. They witnessed first hand how poor African Americans in the South barely received any medical care, as many white doctors refused to treat black patients. Against all odds, they succeeded in establishing a free clinic in Mileston, Mississippi, and then acquired funding for a more ambitious comprehensive health clinic in Mound Bayou, the Tufts-Delta Health Center. Their agitation for improvements in medical care helped spur a dramatic reduction in the infant mortality rate among black people in the state. The desegregated practices of the Delta Health Center and its counterpart in Boston, Massachusetts, impressed Sen. Ted Kennedy so much, he pushed through $51 million in funding for community health centers. There are now over 1,000. Other MCHR members volunteered at free community health clinics elsewhere, or organized health programs for poor children. The organisation even pioneered the idea of a community-based national health care system that should be funded through a progressive federal tax. “Even civil rights activists, intent on registering African Americans to vote and desegregating public facilities, did not have health care on their radar screen until MCHR came along,” argued historian John Dittmer. 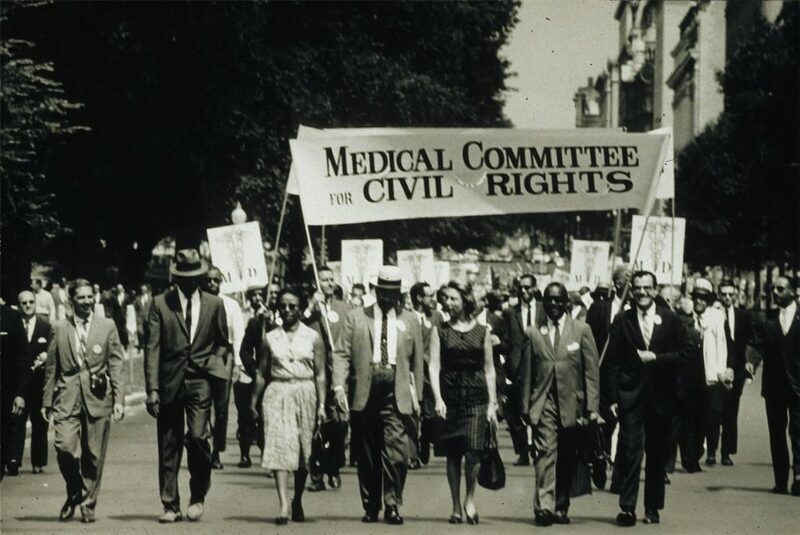 In an interview 40 years afterwards, Dr. Aaron Otis Wells recalled how “There was a group of us, black and white, that met in a church” in New York City, and soon the group “decided that we should form a group of physicians, nurses, truck drivers, transportation people, and whatnot to band together and go support these civil rights workers in the south”. Within a year, he was the first national president of the MCHR, telling Dr. King in person that they were ready to help. “I was in Greenwood at the time when Philadelphia, MS came into the news as the place from which the three murdered civil rights workers-Mickey Schwerner, James Chaney, and Andrew Goodman-had disappeared. We wanted to be a medical presence for the young college students who had left school to go south to go into rural areas to organize. They had health problems and no doctors. […] They were being beaten, being shot in the face, and some were killed. So we felt that a medical presence was essential for this whole movement. When civil rights marchers headed to Selma, AL, in 1965, and 67 marchers were injured on “Bloody Sunday” after troopers charged at them on horseback, with tear gas and billy clubs, the MCHR was there as well. They brought five doctors, four nurses, a mobile health unit and five MCHR ambulances. But the events of that day also illustrated the risks they faced. Two of the physicians were taken away to the county Court House and threatened that, if they gave first aid to any injured protesters, they would face arrest. The MCCR and MCHR were only two of the organisations where health workers joined the cause of civil rights and desegregation. Radical groups like the Black Panthers and Brown Berets set up free community health clinics; the Chicago-based Flying Medics provided care to impoverished black communities in Cairo, Illinois. This Martin Luther King Jr. Day, we honor not just the example he set, but that of all the nameless nurses, physicians and health workers who fought for civil rights when it took courage and conviction.